I wanted to call this a review post, but I haven't tried everything out yet. 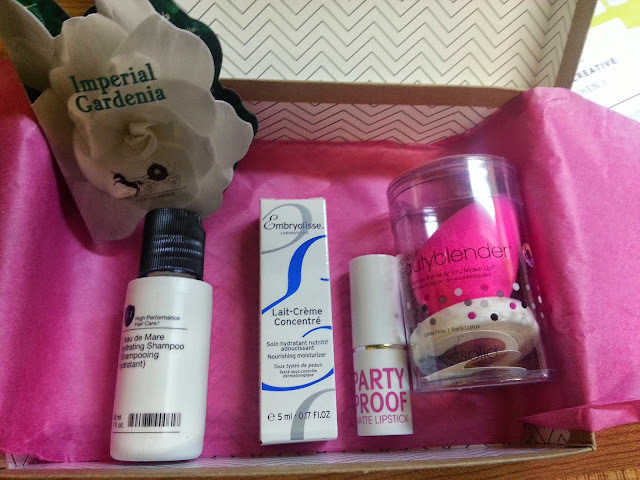 I got my first Birchbox today, and I was super excited to see everything! For it being my first box, I think everything is okay. I mean besides the beauty blender, nothing is really amazing (at first glance) but I have to try everything. I think I will let the subscription continue for month or two, to get a better feeling of the whole thing. Beauty Blender - I'm assuming this is full size. It's a lot smaller than I thought it was, especially since this is listed at $35 on the info card they sent. Either way, I haven't tried it yet, but I look forward to getting to try it... and compare it to my previous precision sponges post with the sephora yellow sponge, and knock off sponge I bought off amazon for less than $3 haha. I am a little bummed though because my box (on Birchbox's page) shows a "BBF" set and I wanted to give one to a friend to try as well, but we only got one in our boxes. This also comes with a small solid beauty blender cleanser. Embryolisse Lait-Creme Concentre (24 Hour Miracle Cream) - a full size of this stuff retails from $16-$28. I also haven't tried this out yet, but I'm a little confused. It says on the info card that "this cult moisturizer moonlights as a primer and makeup remover"
I thought this was just a moisturizer. I'll try it eventually. I'm still trying to get my face to be less dry. Anyway, I will add my opinion on this one in an empties post, whenever I use it up. Harvey Prince - Singular Sensations Imperial Gardenia Perfume - I'm usually not a floral type of perfume person. I like more fruity, tropical scents. I decided to smell this one anyway, and it is nice. I'll wear it and probably finish the sample. But I wouldn't purchase it full size. The full size retails for $32.50 by the way. ModelCo Party Proof Lipstick - I've heard of this brand from Ipsy bags, but I don't think I've ever tried it. The colour I was sent was peony, and it's a nice pink. I don't wear much lipstick, and I have much more than I thought I would, but again... I will use this. This comes in a set of 3, for $23. Number 4 Hydrating Shampoo - I'm a little confused as to why Birchbox would send a shampoo, but not a conditioner to go with it? No big deal, I'll still eventually use the shampoo. I'm actually getting really low on the stuff I'm using now. The full size retails for $39. My review will be up with an empties post for this one. I will get use out of all of these products, which makes me happy because I couldn't say that about every Ipsy bag. This might not be the most exciting box ever, but I'm glad it will all get used, and is worth what I have spent on it. What good is a bag value of $50 if you can't use anything? Ipsy - March 2015 - Sneak Peeks!